The opening round of the eFXC/TTXGP 2012 Australian series was held south of Sydney at Wakefield Park raceway last weekend, with a single race being held on both Saturday and Sunday. Significant interest had started building from the practice sessions held on Friday, with both the Ripperton and Solar Power Australia (Catavolt) machine turning in times within .5 of a second of each other. The off season had seen a number of small but significant refinements taking place on both bikes. Daniel Sailer riding the Ripperton R1 based machine, was surprised by the closeness of the times, the Solar Power Australia machine ridden by Jason Morris had shed 30kg of potentially unnecessary batteries and was out pacing his eR1 machine. Saturday morning saw both machines out first up to do qualifying and so the friendly but very competitive stoush began with Jason Morris taking first blood, smashing his previous electric qualifying record by over 15 seconds. The build-up to eFXC/TTXGP Saturday race time was full of drama with the petrol bikes producing very competitive racing and times, but it seemed the red mist that sometimes clouds riders judgements had fallen to many times, with red flags galore race control was forced to shorten all races for the afternoon by 2 laps. Both Teams now faced a 4 lap sprint and everybody wondered how the very quick Catavolt machine would cope with the great handling Ripperton eR1. From the moment the red lights faded this was going to be a race that would be remembered for some time to come. The Catavolt machine had the mumbo to get a good start but it didn't take Sailor long to wedge his eR1 on the inside of Morris and take the lead, this would be the nature of the race for all four laps with neck and neck lead swapping racing throughout. The interest this close racing produced in everybody at the trackside was great, from the commentary guys to the petrol teams, they all watched with great interest, cheering on the riders with each lap. Come the final straight to the flag, Catavolt had pulled a slight lead but a silly attempt by Morris to "whip' his trusty mount with his left hand yanked the safety lanyard from its socket allowing a catching Sailor to take the win. 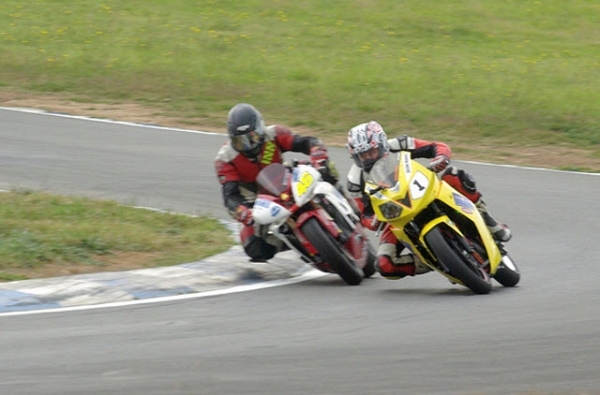 Daniel Sailor also broke the Wakefield Park eFXC/TTXGP race lap record by over 5 seconds. The buzz back in the pits after the race was more than just electric, people from all over came to congratulate the riders. Sunday was another much anticipated race day, with the warm-up session taking on an interesting twist as Daniel Sailor opted to send out a mystery rider to get his machine ready for the next battle royal. The unknown rider turned out to be the much respected Shaun Geronimi who was very impressed by the experience, offering some advice to the Ripperton team on tyre and brake choices. Both teams took the opportunity to put new rubber on their machines and were eyeing each other's changes with interest. Once again the petrol racing produced significant delays and the teams faced another 4 lap sprint come race time. Morris was not about to let a simple error get in his way this time, silence descended as the riders got ready to leave the pits, this had got very focused. The race started with Morris's Catavolt machine pulling away with the extra power available to it, but it wasn't long before sailor was on his heels, pressing here and there, showing a wheel, pulling back , then making a successful passing move to take the lead. But Morris had the power to take back the lead, it took a couple of laps for Morris to figure out the new handling features of the new rubber, but his experience with Supermoto allowed for some quick learning. Racing was very close with a number of lead changes but you could see a hunger in Morris's riding style, he was pushing harder than he had previously. He took the win with a slim 1.2 second margin. "We have come so far in the 12 months we've been running as its been mentioned before we've drop now officially 15 seconds from where we started out and anyone within motorsport knows that's a longways to come in 12 months"
"Technically Jason's motor is twice as big as mine but I think mine handles better, on track its crush kill destroy but off the track were good friends, we help each other out with tools and battery chargers."